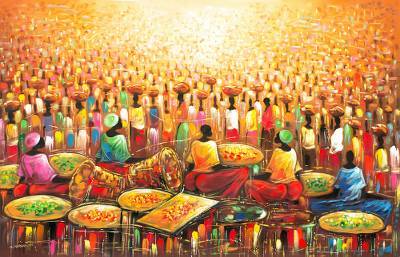 Signed Impressionist Painting of Market Scene from Ghana, "Productivity I"
Captured with a rich array of vibrant colors, this Ghanaian market scene is painted by Bernard Mensah. Merchants stand in the foreground with their wares, framed against a throng of village people awaiting their turn. Mensah paints in the impressionist style, reflecting on the hardships of daily life in Africa.